If your pet dislikes baths or becomes smelly in between grooming, a waterless shampoo may solve your problem. A waterless shampoo does not require liquids of any sort, is inexpensive and can be easily applied to your pet. This shampoo method is not as thorough as a full bath but can work well for maintenance of your pet's coat in between a complete grooming. It can also be used if your pet cannot be bathed for medical reasons. Do not use a dry shampoo method on a pet that has open sores, as the sores may be aggravated by the process. Take your pet outside or to an area where debris will be easy to clean. Brush your pet to remove any knots, loose hair and dirt. Sprinkle the pet's fur with baking soda. Massage it into the fur. The baking soda will absorb odors, oil and dirt. Brush your pet until no baking soda remains. Place 1 cup of cornstarch and a quarter cup of baking soda in a small covered bowl. Shake the bowl to thoroughly mix the ingredients. Sprinkle the mixture over your pet's fur. Massage it into the fur. The mixture will absorb odors, oil and dirt. Brush your pet until none of the mixture remains. Rub the pet down with a towel to remove any stray remains of the mixture. Use oatmeal in place of cornstarch. Add rice flour to either treatment. 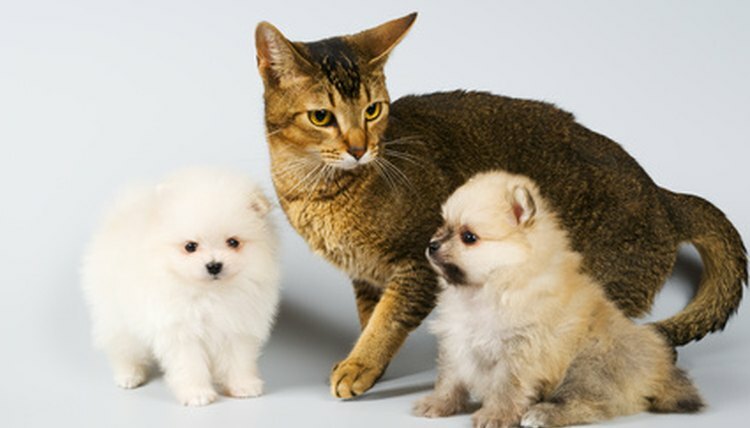 Leave the mixture on your pet's coat for at least 20 to 50 minutes when extra odor absorbing is needed. A natural-bristle brush will work better to remove oils from your pet's coat. Do not allow the mixture to get into your pet's eyes or nose.